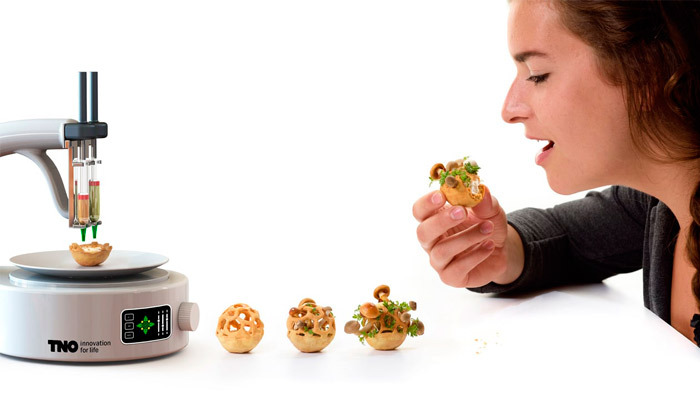 A guide to 3D Printed Food – revolution in the kitchen? We all remember the Replicator, the Star Trek food manufacturer, able to turn any molecule into edible food and whole dishes. 3D food printing is able to make dishes from different pastes and materials, so it seems we are getting closer to the science-fiction concept. However, this time we are not in a sci-fi movie! Just look at the innovations already offered by different manufacturers: 3D Systems’ ChefJet, Nautral Machines’ Foodini, BeeHex’s Chef3D, etc. These are all machines that can make chocolate, pasta, sugar and even more dishes: the possibilities are almost unlimited. 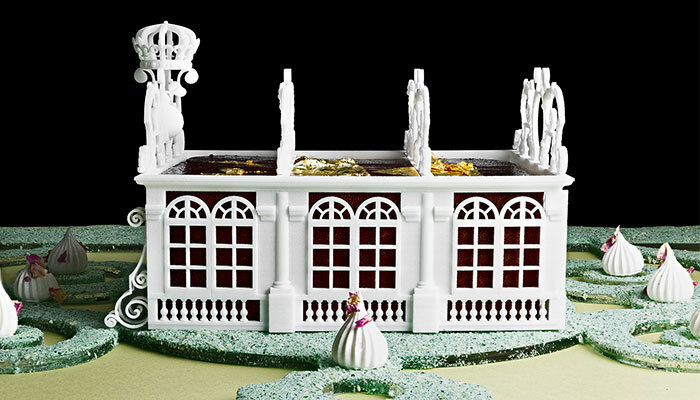 An homage to the Versailles palace, printed in sugar. The first results of 3D food printing, however, were not spectacular. The printed objects were made from a sugar paste and were often not desirable for consumption. But the development of technology, especially FDM, has helped perfect the process so that you can now make chocolate, sweets, or even real meals. One of the main advantages is undoubtedly the freedom of design, which is already widely used in other sectors. Indeed, 3D printers are able to create very complex shapes that are difficult to achieve with traditional methods. This also applies to 3D food printing. Originally, most of the machines used were modified FDM printers. 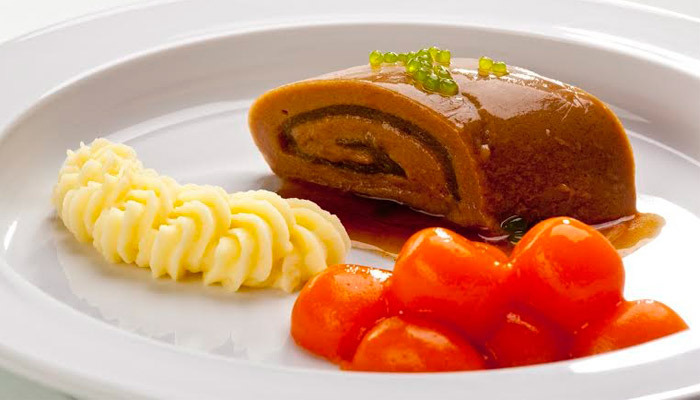 Today we already have 3D food printers specialising in the production of delicious and refined dishes. But what is the future of 3D food printing? Can it revolutionise the way we cook and eat? In 2006, NASA began researching 3D printed food, some have called this project the origin of 3D food printing. In 2013, NASA developed another project, the NASA Advanced Food Program, with a simple mission: how to best feed a team of astronauts for longer missions? In cooperation with BeeHex they developed the Chef3D, which was able to 3D print a pizza. The pizza only had to be pushed into the oven. All in all, 3D food printing in space travel has the main goal of making the life of astronauts more pleasant and thus more attractive for longer missions. NASA already saw some advantages in the new technology. The current food options within space travel are dull and unattractive for astronauts and printing food could make it much more attractive. If we take a look back at our world, we can see that there are many opportunities to use the technology in the food industry. Many companies have recognised the opportunities and are taking advantage of 3D printing different foods, from sugar and chocolate to pasta and vegetable mixes. But why 3D print food? If you can buy the same food at the supermarket or even make it yourself, why put energy into this new technology? 3D printing is a relatively new technology. Understandably, very few people know about printing food and tend to reject it. We talked to Lynette Kucsma, CEO and co-founder of Natural Machines (manufacturer of Foodini 3D food printer), and that’s also how she reacted when she was first introduced to the idea of 3D printed food. It has the same appearance as more processed, packaged food. Nevertheless, the goal was exactly the opposite as Lynette explains, “If you eat something from food manufacturers, which includes pretty much anything packaged in the supermarket, then you’re essentially eating 3D printed food”. Indeed, the food goes through a machine straight into a mold. 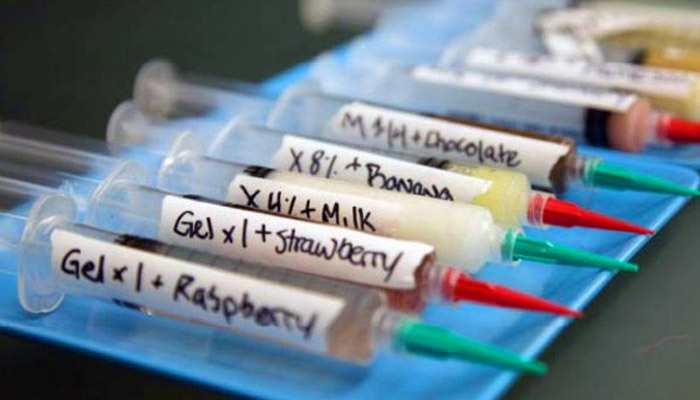 With a 3D printer, however, you can make your own decision about which ingredients you use. Lynette also emphasises the different opportunities of 3D printing food. The young Creative Machines Lab researcher Jonathan Blutinger also agrees with Lynette’s observations. It is true that more innovative products can be created. New tastes can be elaborated and both the health of consumers and the environment could benefit from the new technology. The last revolution for food processors was the microwave and this innovation was more than 70 years ago. It’s time for a new one. In these modern times we tend to pay a lot of attention to our diets and yet fast food restaurants are becoming more popular, children resist broccoli and we don’t absorb all the nutrients we need. Lynette Kucsma believes that this could change once people get introduced to printing their food, “People will again be more interested in what they eat,” she explains. She herself has a Foodini at home and has had many positive experiences, especially with her children. 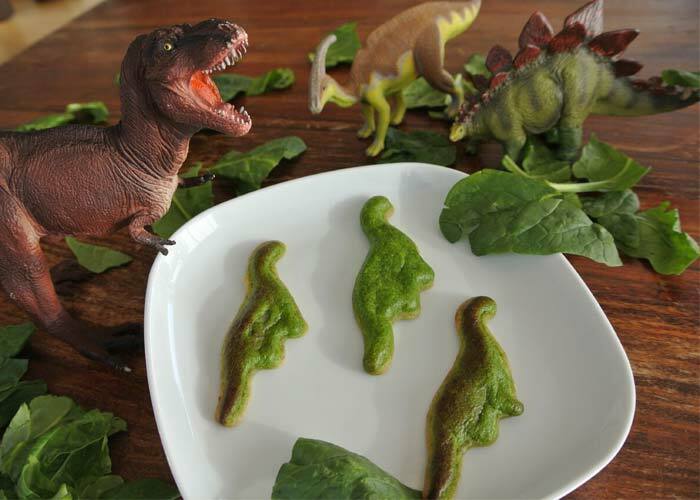 For example, whilst normal spinach is rejected by her children, it is much more attractive in the form of small dinosaurs. Also, having your own choice of ingredients allows you to cater to special diets. In today’s society, trends such as veganism, gluten-free and dairy-free are on the rise. 3D printing can respond to these growing trends. In addition, you can coordinate your devices to the 3D printer. Lynette chose the example of her fitness tracker displaying calorie consumption, which in turn transfers the data to the 3D printer to create a customised meal. This data may also be relevant to insurance companies, but it raises many privacy issues. Jonathan Blutinger told us about another application that is aimed at people’s health. He talked about the use of 3D food printing in hospitals. First of all, the meal can be perfectly adapted to the patient’s nutritional needs and lead to a better recovery. Projects such as Biozoon also help to ensure that older people do not have a uniform porridge in front of them despite the difficulties they experience when chewing. Instead, the food can be reprinted in 3D in a more pleasant consistency and increase the standard of living of many people in old people’s homes or hospitals. Additive manufacturing also offers the possibility of using other protein sources. While in the western world there is a great reluctance to eat insects, in other countries it is quite normal. And rightly so: the small insects are valuable protein carriers! With her project “Insects au Gratin”, designer Susana Soares pointed out that meat consumption needs to be reduced. As a substitute, she uses insects, which are generally rejected in the Western world. But insects are more environmentally friendly because they produce less methane and consume less water. With the help of 3D printing, the initially unappetising protein carrier can still be used. With the help of the new technology, the insects will be brought into a more attractive shape, which will also appear appetising to the Western eye. “The influence of aesthetics on the choice of food is well documented. The appearance of the food influences the acceptance and the taste experience“. This last point also concerns food left to waste. Here, the focus is on food that is still good, but simply not “nice” enough for sale. This starts with the remaining broccoli left in your food cupboard, but escalates up the wider food chain. In cooperation with a fillet manufacturer in Iceland, Natural Machines would like to start right there. Lynette told us about the “ugly” leftovers from the production process. Nobody would buy them voluntarily, especially if they had an absolutely flawless fillet. Nevertheless, there is nothing bad about the leftovers. With the help of 3D printing, the leftovers are to be included into a more appetising shape and thus kept in the food chain. Even if some application possibilities already exist and the interest is quite large, there is still an obstacle. That is, cooking the product you get. It was already the case with the 3D-printed pizza and has not yet been completely solved: the printing of the food works, but it is still necessary to cook the meal separately after printing. Lynette told us that Natural Machines is also working hard to make the 3D printer an everyday food processor. Jonathan is also researching this obstacle at Creative Machines Lab. His work focuses on the use of lasers to cook food during printing. Laser cooking is a precise method of using the heat of a laser to cook. The researcher is currently investigating different lasers for different foods. He focuses primarily on blue and infrared lasers. While the blue laser produces a penetrating cooking effect, the infrared laser mainly tans the surface and combined, these two could achieve a perfect result. However, the software behind it requires a high degree of control and accuracy to control the speed and temperature of the lasers. “The ultimate goal is to combine this technology coherently on a machine that is capable of extruding and cooking your food according to your wishes and needs,” says the young researcher. 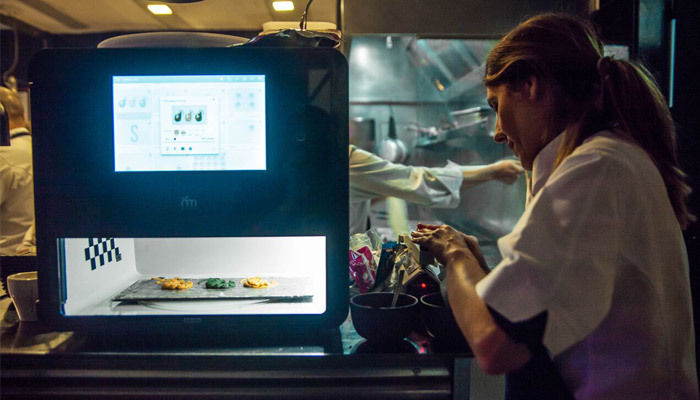 Both the technology and the people aren’t ready yet to have a 3D food printer in the kitchen, but those who really care about it agree that it’s only a matter of time. 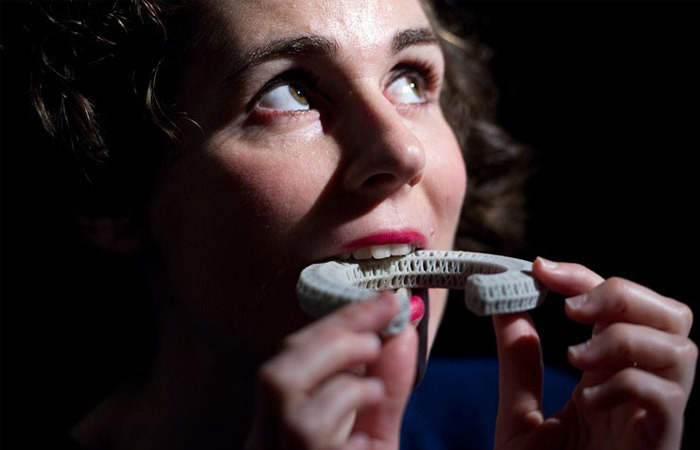 “Any project that implies a behavioural change, especially in relation to food, takes a lot of time to be accepted and implemented,” says Susana, who often encounters skepticism with her 3D-printed insects. But the goal isn’t to get all our food out of the 3D printer either, says the founder of Natural Machines. Ultimately, it is a kitchen appliance that can be grooved to try something new and save time. Will you soon have a food printer? “The technology is almost there,” says Jonathan. “It’s all about packaging it and selling it so people will accept it. It happened with the microwave and pretty soon with food printing“. What do you think about printing your food in 3D? Let us know in a comment below or on our Facebook and Twitter page! Don’t forget to sign up for our free weekly Newsletter, with all the latest news in 3D printing delivered straight to your inbox!